It is not a day you look forward to. Particularly the first time. I am fortunate that my husband is clinical and that science aids in a clean, direct approach. By clean, I only mean the cut. There are still a mess of feathers in the yard that will take time to flutter away or return to the earth. We decided to use a simple implement and gravity. We saved everything. Nothing was wasted, thanks largely to Auryn, our big dog. Blood was cured and used to nurture our gardens. Feathers are composting. Bones after meals are frozen and saved for a rich stock I have planned. Even the feet… far too many to eat all at once, are apparently a delectable frozen treat for a hard working farm dog. About the only thing we didn’t choose to find a use for was the head, but the dogs found their way into the burning embers and ate those too. Practicing the ‘Top of the World’ frankness of Hans Ruesch. 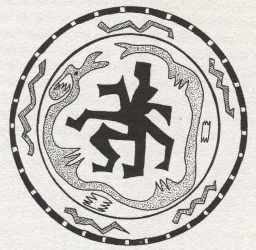 Core of the Soul mandala, surrounded by a serpent symbolic of transformation and renewal. Points on the zigzag stripes represent your connection between points of view. I had already forgotten my initial apprehension during our transition to Connect with our Food Source. Anything new is different, unusual, strange and possibly unwelcome especially when it challenges and changes your way of life. I was concerned about culling day and whether or not I would participate. The group of folks that gathered to help couldn’t have been more committed to a humane and healthy process, respect for life and diligence to get the job done. When we did have our first meal, which was sooner than we thought, we were pleasantly surprised by the flavor and tenderness. It is the first meal we have ever eaten in total silence, awed by the process and the shift of consciousness. Though changed, we are pleased that we were not scarred by the experience. Our birds were healthy, the process respectful, nothing wasted… we honor our food source and practice mindfulness at each meal.